The speed at which humans have steadily been introducing new technologies into the world has grown exponentially in the past decades, and in the recent years became almost neck-breaking. The invention of the internet was an obvious benchmark in this evolution – it has been world transforming, and one cannot overstate the wealth of business opportunity it has brought for modern entrepreneurs. Inventions like the smartphone followed suit, industry-transforming in their own right. These new technological avenues have allowed entrepreneurs to relatively easily disrupt incumbent institutions and existing business models, in a way that was not possible before. And it is obvious today, that technological advancement shows absolutely no signs of slowing down. Today, almost every startup dubs themselves a ‘tech startup’, but there is a profound difference between ‘tech-enabled’ and ‘tech-centred’, or the so-called ‘deep tech’ businesses. In a nutshell, the key difference lies in the fact that tech-enabled businesses use technology that is commonly available, whereas deep tech businesses create new technology. Deep tech is essentially the crossroad where engineering and scientific discovery meet, and the possibilities which this creates are huge. The research and development carried out by deep tech companies is having vast implications and direct impact on many areas of business and study, including AI, robotics, fintech, blockchain, big data, bio & medtech, nanotech, augmented & virtual reality, IOT, or smart homes/cities. Deep tech is therefore set apart by its profound enabling power and its potential to catalyse industry-wide change. Deep tech companies often possess patents or defensible engineering innovations that distinguish them from those companies that are focused on the incremental refinement or delivery of standardised technologies. This distinction matters greatly when it comes to funding. Deep tech companies carry not only significant potential rewards for an investor, but also a significant risk profile. The challenges faced by deep techs can often go beyond those faced by regular startups, partly due to the complexity of their underlying technologies, as well as the time that it takes to develop and market them. More often than not, the assessment of the potential of a deep tech startup takes significant technical expertise on the investor’s part, and this may not be easy to find. The development of technologies is often long and arduous, and requires a much bigger investment from a potential funder, leading to capital intensity concerns. 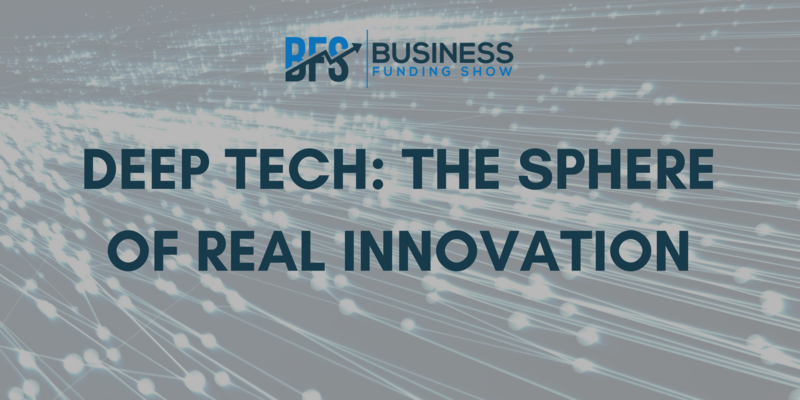 Deep tech entrepreneurs, therefore, have to aim to find investors who specialises in their respective fields, and who understand the specific nature of the deep tech sector. We have seen a significant increase of accelerators and incubators who specialise in delivering services for deep tech businesses in recent years, and an increased awareness from VC firms and public bodies too. Essentially, investors are looking for companies who can present a balanced and realistic business plan, with a clear assessment of their market potential. B2B models are preferred, as these can bring higher potential returns quicker. If you can present tangible engineering innovation, as well as a relatively short development period (not more than 3 years), you can put yourself at a big advantage in the eyes of a potential investor. Thanks to its industry-changing potential, investment in the European deep tech ecosystem is booming at the moment, and UK leads the way in terms of access to finance. It is therefore incredibly important that entrepreneurs understand the funding options which are available to them, and utilise them. Deep tech entrepreneurs! If you are seeking funding, allow us to introduce you to some of the top investors and service providers who are looking for businesses just like yours! You will be able to gain face time with multiple funders in a 1-to-1 format! This exclusive event is going to take place at 18:00 on the 18th of September 2018 at WeWork Aldwych. Click here for more info and to book your tickets!